A new website and marketing plan for WYGS saw search visibility increase by 578%, with a 225% increase in enquiries. West Yorkshire Gas Solutions are a heating, electrical, plumbing and renewable energy company based in Halifax. They give people a friendly, reliable service and expert advice, all for a great price. They’ve been going for quite a few years now, and are very well regarded across the county and beyond – but were finding their branding as West Yorkshire Gas meant people didn’t quite get the full extent of the work they did, both physically and geographically! 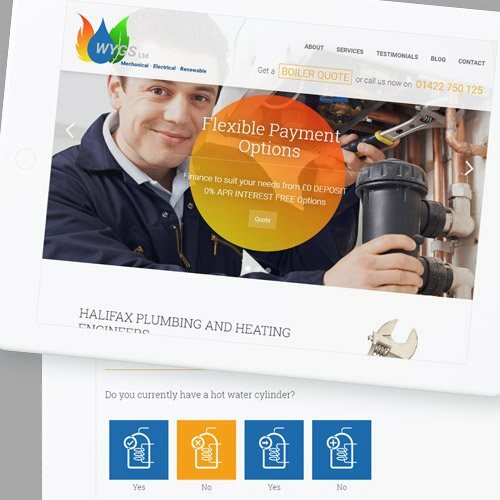 West Yorkshire Gas Solutions were undergoing a subtle rebrand to be known solely as WYGS Ltd, so they could be seen as a nationwide company with a more diverse portfolio. They wanted a new website that was a bit more modern than what they had before, and could help them generate leads across the UK. Our designer took the WYGS logo and expanded on its colour palette and style to develop a full visual identity and language for the brand. The site was designed to be bold, generally quite minimalist in aesthetic and straightforward in layout to keep things clear and easy to use, putting the focus on large images, and highlighting headline services and offers. Subtle transitions and mouse-over animations bring the site to life, with a homepage slider introducing visitors to the key parts of WYGS’ proposition. These features are applied with a light touch to make sure they don’t detract from the content. 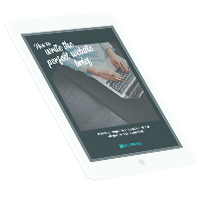 Our content writer worked closely with the WYGS team to make sure a combination of their friendly approach and expert knowledge came through in the site’s copy. It was important to find the right balance to reassure some customers that they had the technical know-how, without putting others off with too much jargon – as well as including the keywords identified by our research. As WYGS offer interest-free finance options, we also had to make sure that all the financial information was properly accounted for, with the right representative examples in the appropriate places. The new site’s content is greatly expanded compared to the old version, giving much more information to customers as both a service brochure and an advice hub. The WYGS site is a WordPress build with our usual custom fields and additions to make sure everything’s optimised for performance monitoring and search, and that the content management system is as easy as possible for the client to use. 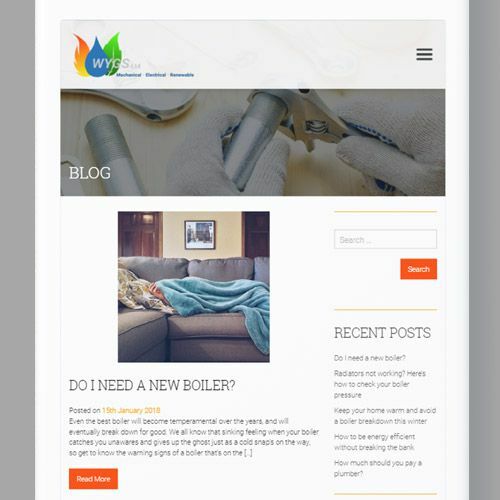 One unique feature is the quote calculator, which asks users to input a few details about their home, and will then auto-generate and email out a boiler quote. They told us the process they wanted to take users through – all we had to do was style it up to match the rest of the site and make it work! This is an essential part of WYGS’ lead generation activity, helping them to build a database of sales-qualified leads directly through the website. In addition to the quote calculator, we also helped WYGS develop a marketing strategy to further improve SEO and lead generation. Our efforts have resulted in a huge increase in enquiries through the website – a 47% increase in traffic over six months has led to a 225% increase in enquiries. Keeping a new website actively updated is very important, so we developed a blog plan based on our keyword research for the on-page copy, and write two blogs per month for the site. We have also researched, written, designed and promoted an in-depth guide to air source heat pumps, one of WYGS’ renewable energy options. This is gated content that users need to sign up for, aiding with lead generation. We manage WYGS’ social media accounts across Facebook, Twitter and LinkedIn, scheduling regular updates and sharing engaging content. Finally, we run a number of targeted PPC campaigns focused at different keywords, geographic regions, and service offerings, constantly monitoring results to improve performance. We’ll be continuing to support WYGS with website maintenance, and will be working closely with them on their marketing activity. All in all, it’s been a very successful project for both WYGS and the team, and we look forward to continuing to work with them!